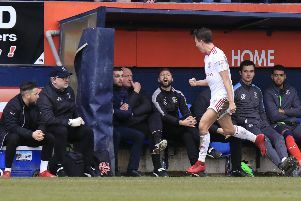 A passionate Hatters boss Nathan Jones has urged his side's fans to stick with the club if they want to achieve their goal of promotion this season. The Luton chief saw 2,002 supporters travel up to Coventry City last night, with a number booing at the half time whistle, as Town were trailing 2-0 and looking like they were going to lose a second game in four days. However, the visitors produced a rousing second half comeback, as goals from Scott Cuthbert and James Collins ensured Luton went home with a point. An animated Jones went over to the away end at the final whistle and on what his message was for the supporters, he said: "Stick with us, definitely stick us, because there’s going to be twist and turns. “We have given them a hell of a season so far. We have given them enough football, enough goals, enough entertaining things to earn a bad performance now and again. “We gave them a half and they weren’t happy about it, but they’ve got to stick with us. “They want to get promoted? Because we do and we work tirelessly every day. "I am a passionate manager and I work tirelessly, but they’ve got to get behind us as well, now they might need to drag us through the odd game now and again because they’re a good group this and an honest group. “Yes, we make mistakes, but that’s the league, that’s the level and that’s what happens. "So now if they want to get out of this level, then they have got to play their part and they have done tonight, second half they were magnificent and it’s going to be like that. “Luton’s a big game for everyone, it’s not a normal game. "People go to other teams in and around the top seven and they go there because they want to win the game, they think they can win the game, some people come to Luton, they don’t believe they can win the game. "So they sit back and it’s difficult, but with us, we’re a brave team, we try to play the right way. Now we’ve just got to try and get over the line and getting over the line, might not just be an absolute stride, getting over the line might be a fight and a battle and a graft and we have to do that, then we’re prepared to do it, but make sure we’re right with us. “It’s going to be a big rest of the month. "We’ve got three games to go and then we’ve got a massive April, where we want to reach our goal. "It's going to be tight, but the thing about us is we’ve played all the best football this year, we’ve scored more goals than anyone else, we’ve earned a reputation and we're going to have battle it out. “We’re in a good position, and that’s what what we’ve got make sure we keep focussing on and keep thinking about and not get any negativity around us." Skipper Cuthbert, who brought Town back into the game, heading home Alan Sheehan's free kick, echoed his managers thoughts, adding: "We need them, theyr'e massive, I've said it all season how well they travel. "They're fantastic and they come here and sang at the end, they were clapping us off, they were brilliant, and they will stay behind us. "Even Accrington with that late goal, they could have easily turned on us, but they never, they stuck by us and they will. "We've got nine games to go, we're all in together and lets get the job done."